The roast took place at The Biltmore Bowl, The Biltmore Hotel in Hollywood. Al Jolson refers to the Chinese as "Chinks" and sings, "My Mother's Eyes" (Jessel must have loved that! ), "Easter Bonnet" and "The Nearest Thing To Heaven." 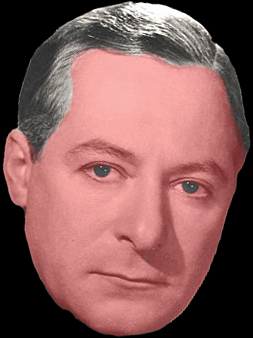 George Jessel responds. Jack Benny (toastmaster), Mark Warnow (composer), Eddie Cantor, Danny Kaye, Samuel Goldwyn, George Burns, Pat O'Brien, Louis B. Mayer, Bob Hope, Goodwin Knight (Lieutenant Governor, California), Fletcher Bowron (Mayor of Los Angeles), Al Jolson, George Jessel. 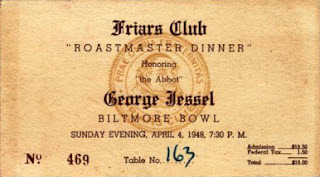 2 comments on "George Jessel - Friar's Roast Of George Jessel 04-04-1948"
We are so lucky to have the recording of this historic roast. 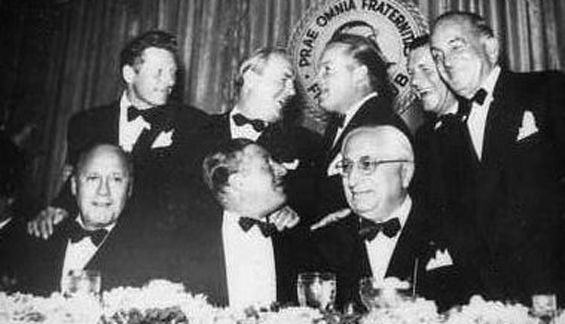 We are so lucky to have a recording of this amazing night in history.